With the development of gene editing tools, experts from the Federal University of Viçosa in Brazil explored on the possibility of engineering spicy tomatoes. The paper is published in Trends in Plant Science. The primary goal of developing spicy tomatoes was to easily mass produce capsaicinoids, which are secondary metabolites that give chilli peppers their spicy flavor and has been proven to have health benefits and industrial applications. 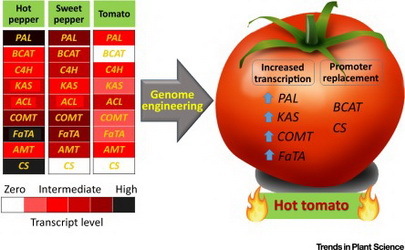 According to the researchers, two genome editing techniques could be used together to turn on the capsaicinoid biosynthesis in tomato. The first one is the transcriptional activator-like effectors (TALEs), a set of proteins secreted by pathogenic bacteria, Xanthomonas spp., when they infect plant hosts. Rapid assembly of the TALE genes into a single T-DNA vector would allow simultaneous upregulation of the expression of some key capsaicinoid biosynthesis genes. Actual experimentation would further exhibit whether the transcript levels achieved will be enough for the capsaicinoid pathway to be functional. Read the article in Trends in Plant Science.